The flayvr iPhone app is a neat tool to organize your photos, create albums, and share with simple, intuitive interface and navigation. The flayvr iPhone app has a great privacy mechanism, so you can control who sees your photos. 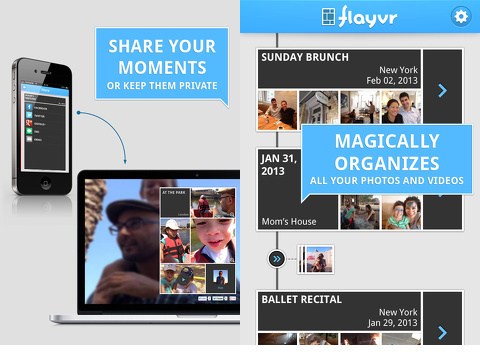 When you are ready to share them, flayvr works seamlessly and much more easily than Facebook’s iPhone app to upload. The flayvr iPhone app has a nice introduction to tell you about its features, and it only requires an authorization to access your iPhone camera roll. With a touch on the screen, your flayvr iPhone app timeline is created. It is reminiscent of a timeline you might see created by a graphic designer for an article. There is a simple vertical line on the left side of the screen, and dates are marked on the timeline with a dot and thumbnail or a rectangle with thumbnails of photos for an album. The album has a date, name, and location, if available. You will have a chance to add those later. As new albums are added, a small banner identifies them for you. The flayvr iPhone app has a knack for categorizing your photos based on the date, so there is a good chance your photos will need very little rearranging once your timeline is complete. But, when you do finesse the albums, the tools and gestures are intuitive and effective. You tap an album, and you move to a larger screen. The photos are arranged in a photo collage, and the photos move through the different slots in the collage like a slideshow. When you tap a photo, it gets larger. The other photos in the album are arranged in a horizontal row under the larger image, and you swipe horizontally to access them. You can also pinch and zoom on photos to see more detail. There is a pen to edit the album, and you can add and delete details and photos. You can add a title and location for the album. If you had location services authorized when you snapped a photo, there is a possibility the location is already tagged. A matrix of thumbnails of your camera roll pop into the lower part of the screen. The camera roll photos that first pop into the bottom of your screen are those adjacent to the album’s photos. You can swipe vertically to access the rest of your camera roll. Photos in the album are marked with a blue check. You can tap a photo to add it, or tap a checked photo to remove it from your album. When you are satisfied with your album, you touch the share icon in the top right corner. You can share to Facebook, Twitter, Google+, SMS text, and email. Your photos are not shared unless you decide to do so. The flayvr iPhone app is a great tool, and it makes the task of organizing and sharing photos easy. 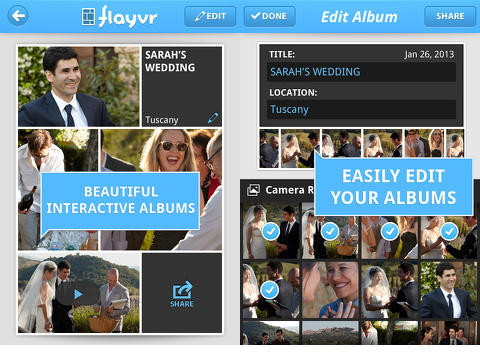 AppSafari review of flayvr – beautiful photo and video albums was written by Jenni Ward on March 21st, 2013 and categorized under App Store, Free, Photos, Productivity, Social, Video. Page viewed 3807 times, 1 so far today. Need help on using these apps? Please read the Help Page.